Chanukah calls us to pay attention to the way a tiny light illuminates the darkness. It challenges us to see the miracles of our own lives, how kindness, generosity and hope have the power to be transformative. 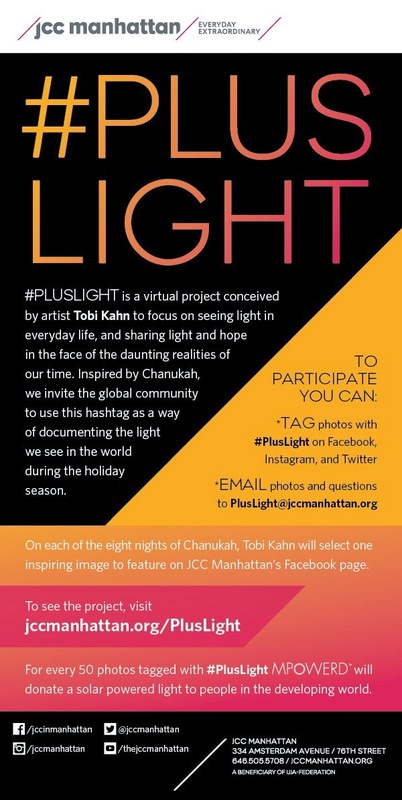 #PlusLight is a virtual project conceived by artist Tobi Kahn to focus on seeing light in everyday life, and sharing light and hope in the face of the daunting realities of our time. Inspired by Chanukah, the JCC Manhattan invites the global community to use this hashtag as a way of documenting the light we see in the world during the holiday season. Take pictures of light wherever you see it. Streetlamps, menorahs, candles and more. On each of the eight nights of Chanukah Tobi Kahn will select one inspiring image to feature on the JCC Manhattan Facebook page. For every 50 photos tagged with #PlusLight MPOWERD will donate a solar powered light to people in the developing world living in energy poverty.